For chronic pain patients, the title, “The Gift of Pain” may be off-putting. If you suffer daily from pain, how can that be a gift? In an educated, highly conversational tone, Dr. Paul Brand explains that pain is indeed a gift, one that no one should wish to be without. This book reads much like a personal journey tied in with the history of medicine in the 1900’s. Brand received his medical training in London during World War Two, training that would eventually be priceless during his work with lepers in India. Raised by missionary parents in India, Brand saw primitive medical procedures performed daily by his parents – people coming to them in the extreme pain of a toothache or a parasite infestation. While his parents undoubtedly helped hundreds of people who would have otherwise suffered, the crudeness of extracting a tooth with forceps with no anesthesia or numbing agents at all stayed with Brand. Despite this, he enjoyed growing up in India and writes fondly of his youth. A lesson he learned and was eventually able to use is how, even as a child, pain taught lessons. An avid tree climber, he quickly learned not to climb the trees that were inhabited by hundreds of tiny scorpions. Brand left the mission at the age of nine for formal education in England. When he had completed his primary education, his mother urged him to become a doctor and return to the India mission, carrying on the work of his parents. He eschewed this line of thought based on what he had seen as a child in India. His memories had been faded to only include scenes of suffering, and as he says, “pain and suffering, I wanted to avoid at all costs.” Receiving education in stonemasonry and construction, Brand did want to carry on the legacy his parents had set before him – he began training to work as a missionary at Livingstone College. The coursework included a basic medical course to teach the missionaries the skills they would need to bring aid to impoverished rural areas. Brand found himself learning the same procedures and skills his parents had learned and, surprisingly, found himself enjoying the work. The course included hours spent at a charity hospital where the students would learn emergency medicine first hand. It was there that Brand’s medical career started, as he resigned from Livingstone and signed up for medical school. Brand’s focus on pain came early – his natural curiosity toward it led him to sign up for clinical research studies with early thought-leaders in modern medicine. It was through this training that he began to uncover how pain signals travel to the brain, and how the body is one functioning unit, rather than a collection of independent parts. This work led him to working with a leprosy colony in India, where rarely any good physician had traveled. Leprosy was still considered an affliction caused by a curse from the gods, rather than a medical issue. Brand was horrified to discover that the disease had not been studied; a disease of such obvious and permanent deformities. His research and treatment of this disease uncovered that leprosy itself did not cause fingers and toes to fall off, rather, it caused a complete paralysis of the nerves. Because leprosy sufferers could not feel damage done to their skin by a burn or stepping on a nail, the skin would become infected, decay, and eventually cause bone damage, which would lead to subsequent loss of appendage. Throughout study, it became apparent that leprosy was not as contagious as once thought, and Brand began dedicating his life to helping leprosy patients regain the use of their hands and feet. Brand is now considered a medical pioneer for creating the tendon transfer technique used to regain the use of the hands in leprosy patients. Throughout the book, Brand reiterates that because these people cannot feel pain, they are without the body’s most basic protective mechanism. Imagine for a moment that you cannot feel pain – would you pull your hand away from a hot stove? Would you feel that you had stepped on a nail and stop to remove it? It goes beyond that, however, as an improperly protected burn will result in an infection and continue to get worse. If you do not remove the nail from your foot and continue to walk on it, the foot will get infected. Without a proper pain mechanism, you are at a severe disadvantage. 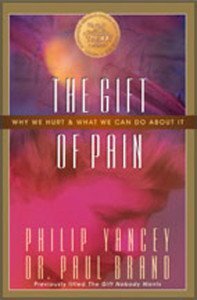 Dr. Brand’s aptly named “The Gift of Pain” explains in fantastic detail that pain is a gift, one that protects our bodies and helps us heal. To order Dr. Brand’s book, go to Amazon.com’s website.